If you’ve been paying attention to my site, and I don’t blame you if you haven’t, but I tend to play two types of games: MMOs and Old-School. I will occasionally boot up a non-MMO game that has been made in the past 5 years, but that’s a rare event for me. I’m generally immune to the rush that I must play the absolute newest stuff. My rationale is that if it’s claiming to be really good now, it’ll also be really good in a few years, too. The benefits of this thinking are obvious: when I do go to purchase the game, it’ll be at a steep discount, bug fixes will have made the game more stable, technology improvements mean I’ll be able to play at the highest graphic settings, and I’ll still be getting the same quality story and gameplay as if I bought it on day 1. Also, the lens of time better shows which games are actually considered great games than the day one impressions do. Good games are like good wine, they last and seem to improve with age. However, when it comes to *really* old games, sometimes the lens of time is tinted with too much rose-coloring. One question I find I ask myself all the time is were the games I played when I was a kid, the games that have shaped and molded my gaming interests today, were they any good? If I go back and play them now, will I still find them enjoyable? One such game series I remember having a very hard time with when I was younger, but I was still very enamored with them. Namely, the SSI Advanced Dungeons and Dragons “Gold Box” series of games based on the Dragonlance universe. And since I’m a fan of playing games in order I set on to find and play the first game in the series, Champions of Krynn. Just trust us on this one, it’s opulent and not just cracked stone walls. Opulent. When looking for the game, my first attempt is to always find a legit copy first, unless doing so is price or sanity prohibitive. For example, the game seems pretty easy to find on Ebay, but I honestly couldn’t tell you the last time I owned a PC that actually had a 3.5″ or 5.25″ floppy drive drive on it. SSI, the maker of the game was acquired by Mindscape in 1994, and eventually was acquired by Ubisoft in 2001, who retired the brand. 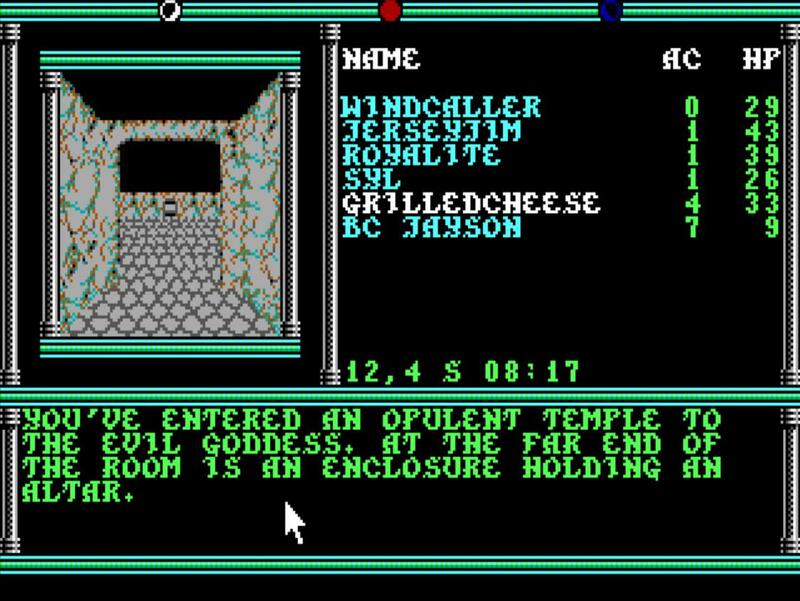 In fact, you can’t even find Champions of Krynn on the Internet Archive, although you will find the game’s sequels. A 25 year old game, you’ll forgive me, but I gave up on paying for it and instead went to my favorite site for the games that have lost their respective owners, Abandonia. To make up for it, I’ll make a donation later to one of my favorite charities, and maybe one to Abandonia as well as soon as my browser informs me that Paypal isn’t being attacked anymore (there… didn’t take long). Karma and I have a funny relationship and I don’t want to upset that balance. At this point, I’m pretty proficient with using DOSBox, so getting the game to run was pretty easy. If you want to check out the Options file I use, which I have tweaked over time, feel free. 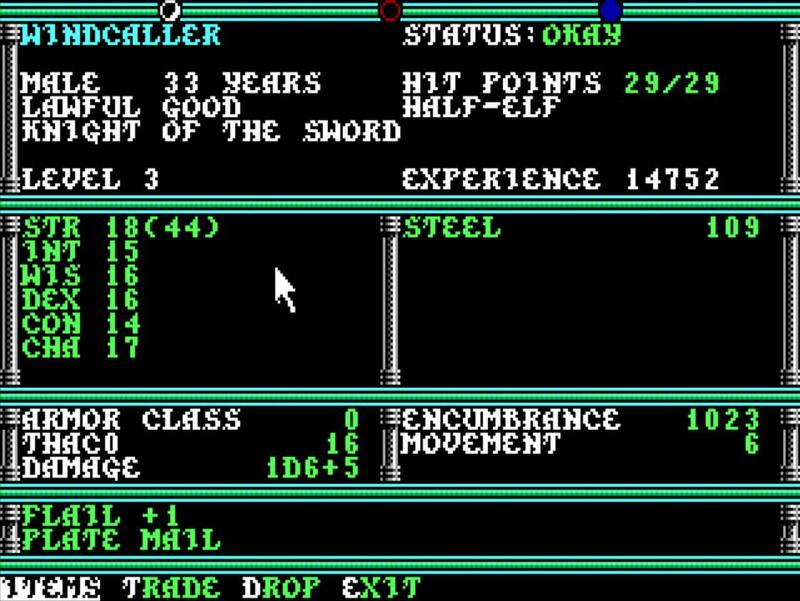 And after loading up, then spent the rest of the night trying to build a party based on a version of Dungeons and Dragons that was out of style by the time I entered high school. I decided to stick with your standard party makeup of pure classes, and then balanced out races as appropriate. For naming, I crowdsourced by sending out a tweet, and taking the first people to reply or favorite the post, just to make it a little more social. THAC0?! That should really say “Rocket Science”. First we have our Lawful Good Half-Elf Knight, Windcaller. The Knight is an interesting class, mostly for a mechanic you just don’t see in games anymore, a class that will straight up give away all the money they find. Knights have taken a vow of poverty, and as such will donate any money you hand them as soon as you get back to town. Giving away loot? What nonsense is this! The trick is, of course, to not hand them any monies. However, gold doesn’t seem to be that important so far, so keeping it from him is kind of mean. Donate away, my friend. The tradeoff is being able to cast Cleric spells at higher levels. Next, we have our Neutral Good Mountain Dwarf Fighter, JerseyJim. Jim’s a close friend of mine so no offense on the Dwarf part, I needed a dwarf, and having all humans is rather boring. Fighters seem to be… well… Fighters. Strong on the front lines, and hard to take down… sort of. Jim seems to be one of the first ones knocked down being right on the front lines and so far the game seems to employ a lot of cheap one-hit methods. Anyone in magical Sleep or Hold are taken down in one shot, for example. One. Dammit Jim! Crit by a Rat?! Then we have our Chaotic Good Qualinesti Elf Ranger, Royalite. Rangers are strong melee as well, but also decent at range. They seem to be very versatile, and Royalite is happy with being a ranger, so it’s all good. I have no idea what the difference between elves are, there is also a Silvanesti elf, so maybe it’s just character flavor. Having elves keeps you from being one-shot, as elves are resistant to sleep and charm… but elves, though. You never want too many of them. Then there’s our Neutral Good Kender Cleric, Syl. Clerics are an absolute necessity. When resting, the only way to heal is to use the Cleric’s spells, and the game calculates the time when resting for the Cleric to memorize a heal spell and cast it, and rememorize it. Thankfully, it does this automatically with the Fix command, but you’re vulnerable to wandering monsters while resting, so it’s tricky. On top of that, Clerics can charm and hold, cheap tactics, but effective for one-hit takedowns. Syl didn’t reply to the tweet, but I was listening to a podcast of Battle Bards and Syl was praising her Lalafell in Final Fantasy XIV, so I decided to make her our diminutive Kender in homage. Kenders are a race that have an infectious charm and are good at finding trouble, and Syl was happy with that. Just trust us. They’re evil. Then we have our True Neutral Human Thief, Grilledcheese. Thieves are very squishy, being held to Leather Armor only. They make up for it by being able to backstab, finding traps and doors, and leveling super quick. Oh, leveling is interesting. Leveling can only take place if we return to an outpost, which isn’t that bad, but each class has a completely different leveling table! With the same amount of experience, a level 5 Thief is only a level 3 Knight. So you have to keep track of each characters experience individually as it won’t tell you if they’re ready to level, either. Excel spreadsheets FTW. Finally, we have our Lawful Neutral Human Red Mage, BC Jayson. 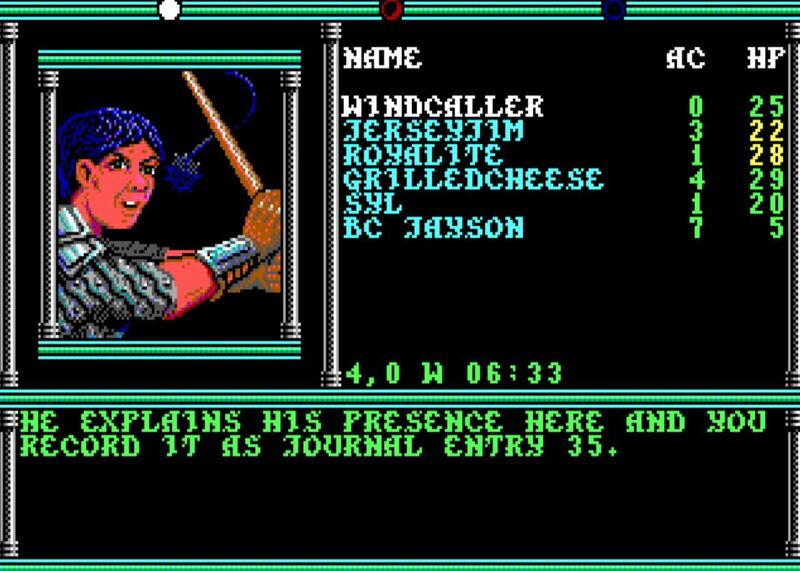 Jayson’s a big Ultima fan, so I hope he doesn’t mind having a D&D character. Cross-geekery, you know how it is. Mages are as you would expect: super squishy, but bring out the big guns. Mostly Sleep spells are used at lower levels, sadly, but they knock out up to 4 enemies at a time and then a follow up long range dart provides the instant-kill. So cheap, but still effective. Thankfully the “Journal” isn’t a copy of 50 Shades of Grey, as this could’ve got really awkward real quick. 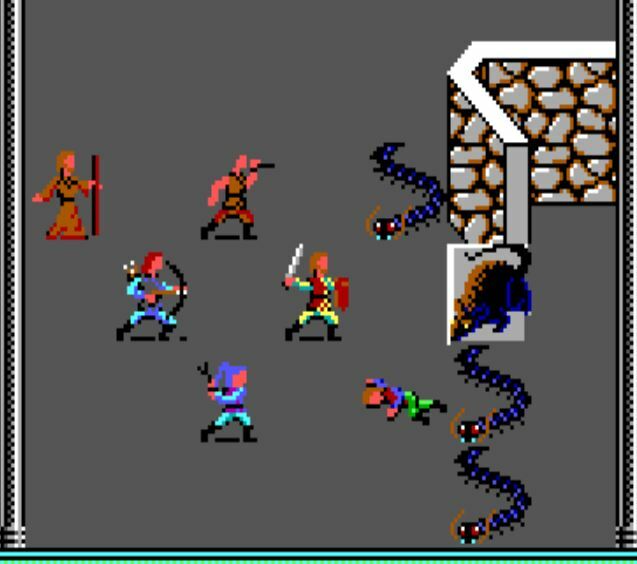 Champions of Krynn is sooooo old school, though. Maybe *too* old school. First, the game doesn’t hold any punches and every fight that is scripted as part of the story is a party strength check. If you can’t beat it, well then you might have to try again with different strategy (or luck), rest up and choose different spells, or level, and the baddies will use every cheap trick they have. So saving all the time and loading again are common practice. On top of that, the game allows you to lower the difficulty, but doing so nets you less experience, so playing on Easy eventually under-levels your party. As any other game, the middle difficulty is the way to go. On top of that, to save game size (3.5″ disks, don’t forget) and to have a form of DRM, every time there is an important plot point instead of just telling you the story, the game points you to it’s physical Journal and tells you which entry to read. You could read all the entries and spoil the story, but there are false-entries posted throughout the Journal, just to trip you up. It’s fascinating the methods like this developers used when their resources were limited. Dammit Jim! Just kidding. It was *everyone’s* fault this time. Falling asleep in the middle of combat and all. So as of this writing, I have cleared the first level of the first dungeon. You’d think this would be a quick endeavor but, oh no, this has taken quite a few sessions already. Leveling in D&D is a rare event, but each character has leveled a few times, leading me to wonder how long this game actually is? Is it only just a couple of dungeons or will this take me forever to play? I’m not sure I’ll stick to it to see the end, but I do enjoy a good D&D session, so you never know. Those graphics, though. The best part of the game is easily the strategic combat. The story seems very basic and pandering, though, and the graphics were considered dated even for 1990, so I’m not sure if the combat alone will hold my interest. We’ll see, though, it *is* classic D&D, afterall. P.S. – Also, I want to give a big shoutout to Xander of Holosuite Media fame for hosting Casual Aggro as part of their blogger linkfest. Holosuite Media has a ton of great people and great podcasts to check out, which I highly suggest you do. I especially am fond of Beyond the Veil, their podcast on The Secret World, but they have podcasts for all kinds of games. P.P.S. – After the massive traffic spike I had yesterday, thanks to a popular developer RT’ing my post on Ultima 7 and EA, I was kicking myself that my blogroll hasn’t been updated since, well, since this blog was created. 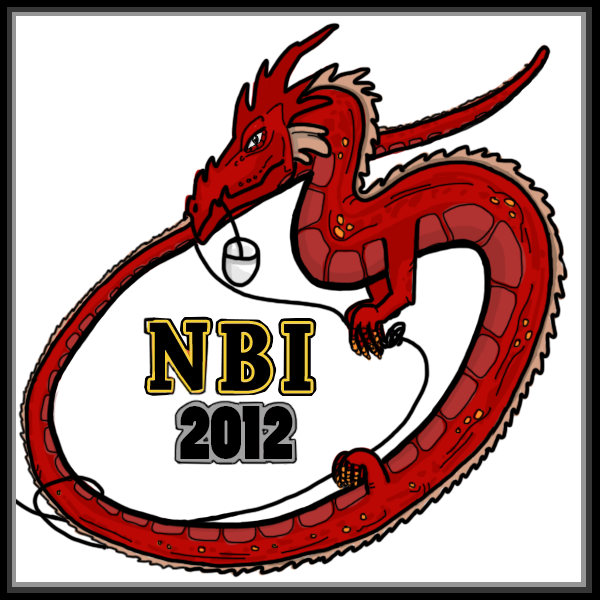 I have went through and updated it to a list of 25 glorious and amazing sites, which you should definitely check out.